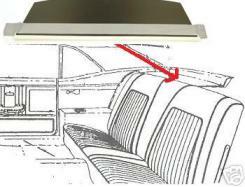 New replacement rear speaker shelf, (Package Tray) for 1967 - 1969 Camaro Trans Am and Firebird. Units have correct cardboard body with vinyl flip over insert where it meets and tucks in at the rear seats. Choose between standard or deluxe mesh with speaker holes. Allow 14-21 days for delivery as many units are custom produced to your exact needs!